The base (or foundation) made usually of acrylic (but can be of flexible acrylic), to hold it all together! 768 Adding tooth to partial denture to replace an extracted or decoronated tooth (i.e. a root stump) – per tooth – add 736 if this is done at the time of the tooth is removal. 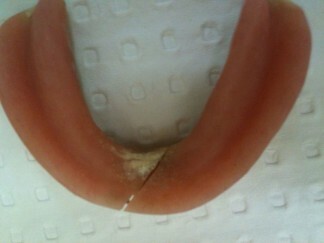 This is able to be done if a model of the tooth with the denture is made before it is removed. The lab then removes the tooth off the model and adds the new denture tooth. 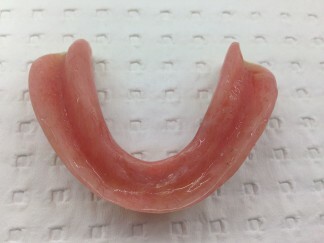 The modified denture is returned ready to replace the natural tooth immediately it is removed. 769 Repair or addition to metal casting or frame of a denture. 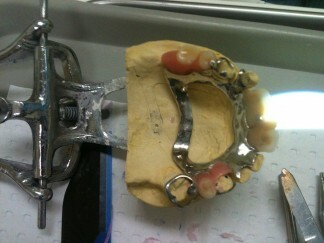 This is a complex procedure which may require the dismantling the denture of its acrylic elements including the teeth. Other item numbers may be need such as impressions.